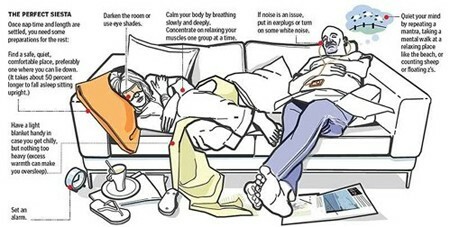 The Boston Globe recently posted some tips to help you get the most from your naps. The information comes in the form of a chart with numerous facts about naps, including the timeline of events in a typical nap, information about chronotypes, and ideas on how to fall asleep quickly and stay asleep. Since our post on polyphasic sleep, we’ve been interested in sleep techniques that essentially trick the body into feeling as rested as possible (the crudest form of biohacking, in our opinion). Many of these techniques are certainly applicable to polyphasic sleep, but one of the most interesting concepts, chronotypes, is not. Chronotypes are simply profiles of sleep habits that denote the times a person’s body is more readily disposed to fall asleep; since polyphasic sleep requires practitioners to sleep several times a day, it is always in conflict with the person’s chronotype at some point in the day. Nonetheless, the chart should help you stay alive if you ever have several back-to-back intercontinental flights. mchlblnc has followed a list. Franck GALLIAT has added a new log for YetAnotherTeensyLaptop.